Bioinformatics is an important interdisciplinary research area with tremendous opportunities in graduate training and industry employment. Yet, few academic institutions offer undergraduate programs designed to prepare students for opportunities in Bioinformatics. The UCLA Undergraduate Bioinformatics Minor is an academic program established in Fall 2012 at UCLA. Undergraduates in any Major can obtain a Bioinformatics Minor by completing an additional 8 courses. Since Fall 2012, approximately 80 students have joined the Minor program. These students represent Majors in over a dozen UCLA departments, including: Computer Science; Chemistry; Molecular, Cell, & Developmental Biology; Microbiology, Immunology, and Molecular Genetics; Ecology and Evolutionary Biology; and Computational and Systems Biology. Over 45 faculty specializing in computational and experimental biology are associated with the Bioinformatics Minor, spanning the fields of biology, mathematics, engineering, and medicine. Course offerings from more than 12 unique departments allow the Minor program to encompass the breadth of the growing Bioinformatics field. Here we describe the principles and philosophy that guided the design of our Minor. Our Core Bioinformatics Courses Teach Interdisciplinary Computation. The foundation of our program is the cluster of three integrated core courses in Bioinformatics. These courses are truly interdisciplinary; they satisfy elective requirements in multiple departments and recruit students from different Majors to the Minor program. These core courses build upon the philosophy that students must first learn fundamental concepts in computation in order to later explore problems in Bioinformatics. These courses offer basic skills and appeal to many students beyond those interested in Bioinformatics. Rigorous Background in Computation. To be successful in Bioinformatics, students must have a solid background in both computation and Biology. Our core courses require as prerequisites a substantial background in computation and statistics. To enter the Minor, we require that students have completed one year of programming and one upper division Statistics course. To complete the Minor, our students take Linear Algebra and one upper division course on Algorithms taught by the Computer Science or Math Department. Our students also take a Molecular Biology course taught by the Life Sciences Department. We believe that it is important for faculty in Computer Science and Program in Computing to teach programming, and for faculty in the Life Sciences to teach Biology. Further, it is important for students to take the same programming classes as do their peers in Engineering majors, and for students to take the same Biology classes alongside their peers in Life Sciences. The Bioinformatics Minor Builds upon the Students’ Major. Every student graduating from UCLA with a Bioinformatics Minor also completes an academic Major program. While we do adjust the Minor curriculum to help students efficiently complete both their Major and Minor requirements within 4 years, each of our graduates has exactly the same amount of training in their Major as fellow Majors who are not in the Minor. This avoids a common pitfall in interdisciplinary education: students only receive a superficial background in each academic area. Bioinformatics is a Research Oriented Field. Our Minor is closely integrated with our undergraduate research program, which places students in the labs of Bioinformatics faculty. Most of the Bioinformatics Minors at UCLA are working in a research lab. Undergraduates are strongly encouraged to engage in research. The Minor allows for a substantial amount of research credits, an allowance that helps students complete their Major and Minor requirements in four years. In addition, many of our undergraduates participate in the Bruins-in-Genomics Summer (B.I.G. Summer) program or similar undergraduate education experience summer programs. Bioinformatics is an Increasingly Diverse Field. The core courses in Bioinformatics are designed to be interesting and accessible to students from a wide variety of educational backgrounds. Each course typically has enrollment approaching 100. Far more students who are not in the Bioinformatics Minor take these courses as electives to fulfill their Major requirements. Student enthusiasm is high for these accessible interdisciplinary courses that combine computational sciences and Biology. We find that this approach boosts broader undergraduate engagement in the field and encourages students from traditionally underrepresented groups to pursue research, graduate school, or careers in STEM fields. Let Excitement Foster Program Growth. Bioinformatics is an exciting area, and specialized training is critical for the next generation of biomedical researchers. However, undergraduate Bioinformatics programs, when offered by a college or university, are typically quite small. Such programs are often limited in size and engagement as students are unaware of the field or become aware of Bioinformatics late in their college career. 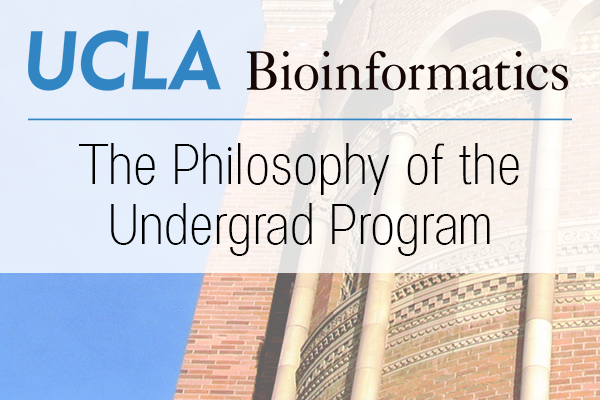 We strategized the Bioinformatics Minor program at UCLA specifically to attract students at any stage of their college career and to maximize curricular flexibility so students can easily complete Minor requirements. Many students are attracted to the Minor when they enroll in Bioinformatics core courses to fulfill elective requirements for their Major; some develop a keen interest in the field and then join the Minor. Even students who are unable to complete all Minor requirements benefit from our program; they complete key coursework and join a research lab, gaining knowledge and experience crucial for gaining employment or admission to graduate school. Our current goal for the Bioinformatics Minor is to graduate 50 students per year. We hope that 10 to 20 of them will enter graduate studies in Bioinformatics. We are not there yet, but are growing. This year, around 10 graduates applied to Ph.D. programs in Bioinformatics. Many of our students recently began or are applying to Ph.D. programs in Bioinformatics and related areas. We expect that they will do very well in the admissions process and have great backgrounds for starting Ph.D. study in Bioinformatics.